To celebrate their 5th anniversary, leading beauty brand Luscious Cosmetics revealed a first of its kind campaign in Pakistan: Luscious Loves Fashion: Presenting a collection of limited edition nail colours created in collaboration with 14 of Pakistan’s leading fashion designers for S/S 2013. Each nail polish shade has been chosen by and named after their respective designer, bringing their signature shade for the season into your wardrobe, so you can wear your favorite designer from top to toe! An Exclusive and Limited Edition range of Nail Colours in collaboration with 14 of Pakistan’s top fashion designers! 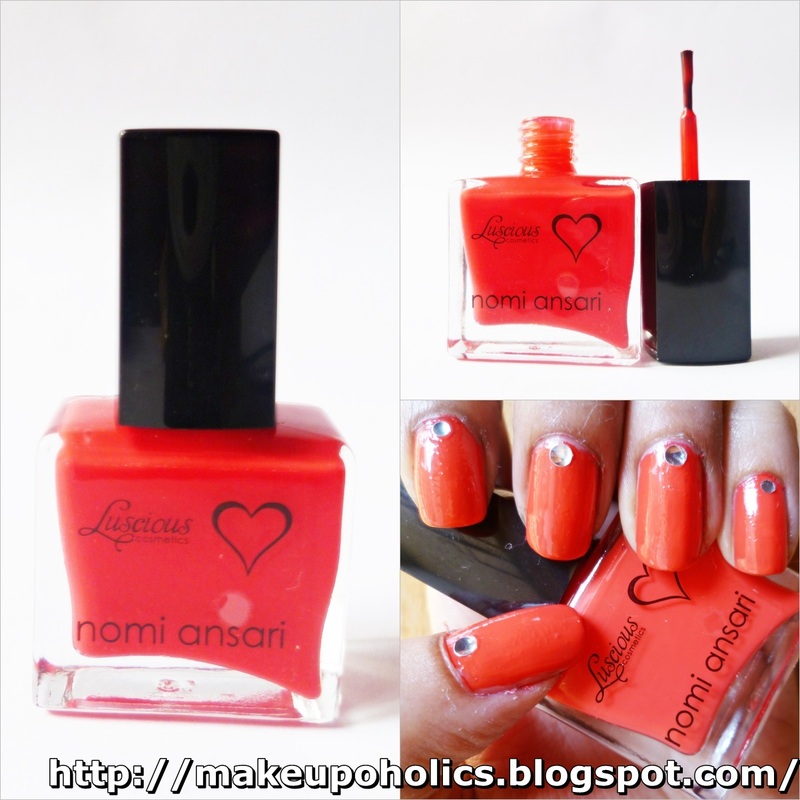 And my second pick from the limited edition is Nomi Ansari's sizzling coral . My Oh My I soooo love this bright coral color .It can surely brighten up your mood . The color is an absolute stunner . 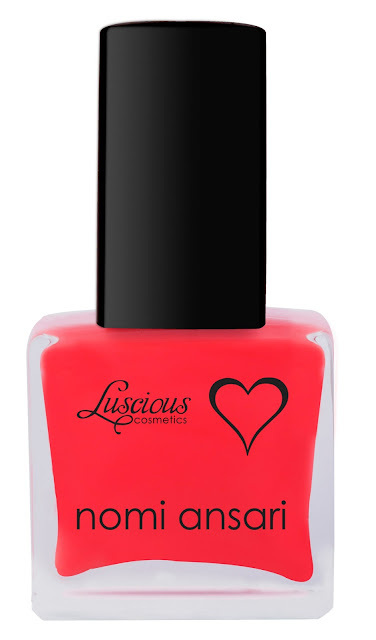 Its no doubt a perfect sizzling coral color that can compliment any skin tone . The formula of this shade is also creamy . Somehow , i like it better then the Ammar Belal's shade . You can achieve the shade shown in the bottle after 2-3 coats . Though it gives you coverage even after applying one coat . It needs less then a minute to dry off completely .Again better then the Ammar Belal's shade. Its also highly recommended to apply the second coat only after when the first coat is completely dried . The staying power of this shade is amazing . I wore it on my nails for more then 3-4 days without a top coat and it lasted perfectly . Soooo love it ! Again , the only drawback would be its small applicator. Though people having small nails may find it perfect to work with it . You love this shade . You find it highly affordable . You expect your nail color to stay fresh on your nails without any top coat for maximum days. Yes , i so love this color and its highly affordable . 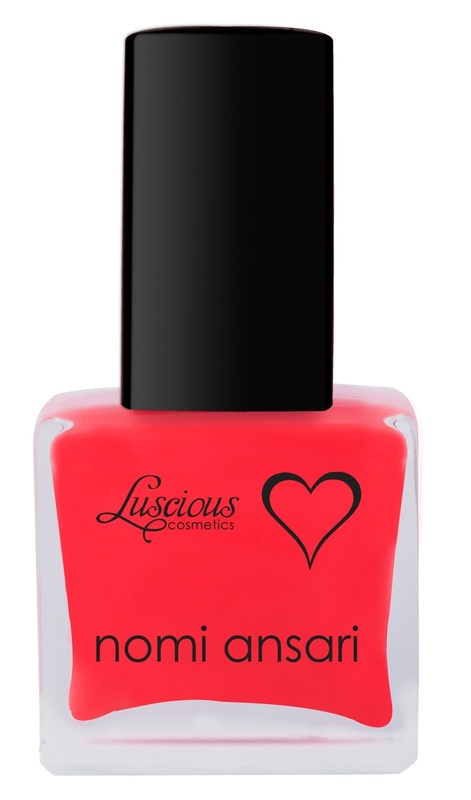 Luscious Loves Fashion Designer Nail Colors Limited edition are available in 14 gorgeous shades and priced only PKR 295 . Once again , I am so much thankful to Luscious Cosmetics for being the first and taking the initiative of recognizing and honoring Pakistani Beauty Bloggers. This proves their international standards and their professionalism . Love to Luscious and to my fellow bloggers. For Luscious Cosmetics and their five year celebration complete information , check my post HERE. So , have a happy LUSCIOUS shopping girls ! do you want to follow each other on bloglovin and gfc?